Creates learning through recreational art painting experience. ​*SCAPE 'Naughty or Nice' XMAS Special - Art Jamming Experience! ​We are partnering with *SCAPE to bring you a Naughty Or Nice Christmas special! Join us at this mass art jamming event this festive season and enjoy a fun and theraputic painting experience while letting your creative juice flow through the acrylic colors and brushes, onto your own canvas. This is a free-style unguided session - you get to paint whatever you want, at your own pace and in your own way, without having to worry a teacher correcting your painting. There is no age limit. Anyone across all ages are welcome to join us! How is the session conducted? This is an unguided session. You will receive a canvas bag that contains all necessary art painting equipment, i.e. brushes, canvas panel, acrylic paint tubes, apron and paper palette, upon registration. 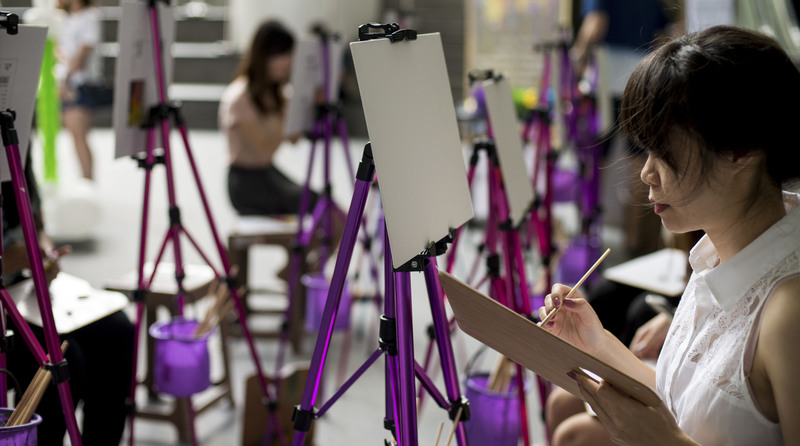 Choose an easel across the activity area and art jam away at your own pace for the next 2 hours. This is a stand up event. Have your credit card/ debit card ready, click on the Paypal icon below and input quantity (number of pax) accordingly. ​Upon payment, you will receive an e-receipt via email. Bring this along and show to our staff at the registration counter on that day to collect your art jamming canvas bag.